In many parts of Asia, the coconut is one of the most widely consumed fruit coming from the so-called tree of life. Apart from its juice and milk, its meat is also a useful part that Asians love to eat fresh and raw, cooked or dried. 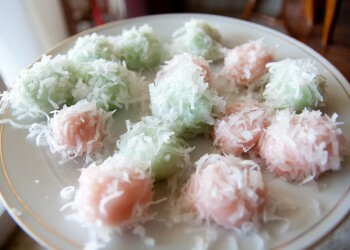 Thailand is one Asian country that makes use of the coconut for its dessert known as the ka nom tom. It’s a traditional and simple sweet treat that features rice flour with coconut filling made into bite-size balls and rolled on dried coconut to make the coating. 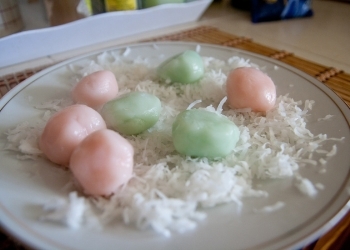 To create this Thai dessert is easy and straightforward. You will need two cups of glutinous rice flour, one-half cup rice flour, one to two cups of white sugar, one-half cup warm water, two cups of brown sugar and two cups shredded coconut. Adding pandan extract will make it colorful and sweet smelling although this is an optional step. Once you have all the ingredients ready, the first step is to mix the glutinous rice and white sugar then slowly add warm water to make a dough. While making the dough, you can add the pandan extract but be sure that you achieve a homogeneous color. When done, leave the dough in room temperature for about 10 minutes. While waiting for the dough to rise, you can create your filling. Melt the brown sugar in a sauce pan and when it caramelizes, add the shredded coconut. Mix until it becomes sticky. Take off from the heat and let it cool down. You may later put it in the fridge. To make your balls, scoop a small amount of the coconut mixture then cover it with dough. After you’ve prepared the balls, boil some water and put the coconut balls until they float. Remove the floating balls from the water and let them cool down. The final step is to coat the ball with the remaining shredded coconut and serve them warm. If you’re heading to Thailand anytime soon, make sure to include this dessert during your food trip in the capital city or any part of the country. This should make your visit to this popular Asian country truly complete after a hearty Thai meal that’s known to many as hot and spicy. To those particular about the coconut or who can’t live without the coconut juice or its meat, you may also try out other Thai dishes that uses this ingredient. There are several of them including soups. Lana Marston is a professional is a professional blogger that shares cooking advice. She writes for RecipeChart.com, where you can find a large selection of delicious recipes.